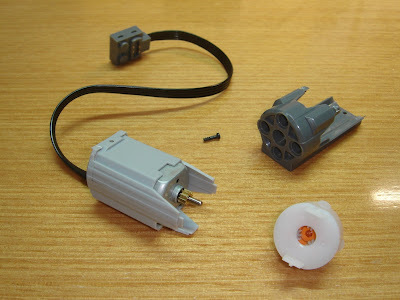 After we have seen Brian Davis' photos from the PF XL-Motor internals sometime ago, I've recently decided to disassemble also one PF M-Motor and further investigate how it works, for some projects I have in mind. 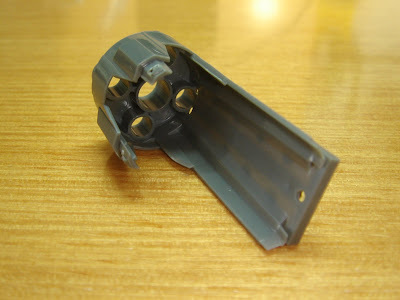 So I leave you here also photos with some internal parts, to answer your curiosity. Additional photos taken during the disassembling process, can also be seen at my BS folder. 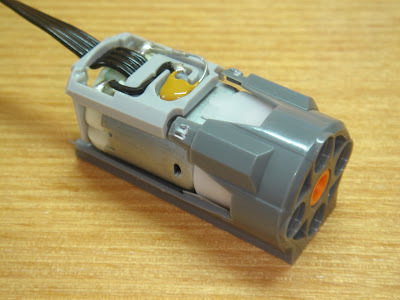 Needless to say both motors construction aren't so much different, apart from the internal parts size. The M-Motor features a similar construction and a two stage planetary gearing reduction mechanism. You can also even see the grease used to lubricate the gears inside the planetary gear train. By counting the number of teeth on every gear type, I tried to calculate the overall planetary gear reductions in each motor (XL and M), which somehow didn't match exactly what I could measure experimentally. Thus to find that gear ratio in a Planetary Gearing (or Epicyclic Gearing) system is somewhat non-intuitive, particularly because there are several ways in which an input rotation can be converted into an output rotation. So I went to investigate further how the planetary gears work and how to calculate the planetary gearing ratios, at HowStuffWorks and Wikipedia, to finally find what was being done wrong. In the illustration below we have an arrangement where the blue gear has a diameter 6 times larger of the yellow gear. 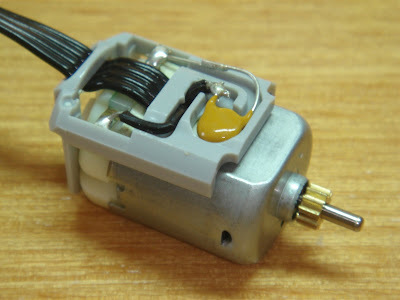 The red gears' size is not important because they are there to reverse the direction of rotation, so that the blue and yellow gears turn the same way, to increase load distribution and torque capability, to achieve system balance and so that input/output shafts are also in the same axis. I believe the explanation below, taken from the HowStuffWorks, explains it all. "In this gear system, the yellow gear (the sun) engages all three red gears (the planets) simultaneously. All three are attached to a plate (the planet carrier), and they engage the inside of the blue gear (the ring) instead of the outside. 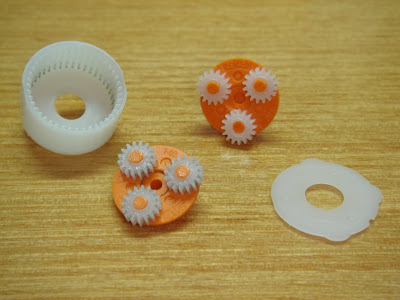 Because there are three red gears instead of one, this gear train is extremely rugged. The output shaft is attached to the blue ring gear, and the planet carrier is held stationary -- this gives the same 6:1 gear ratio. 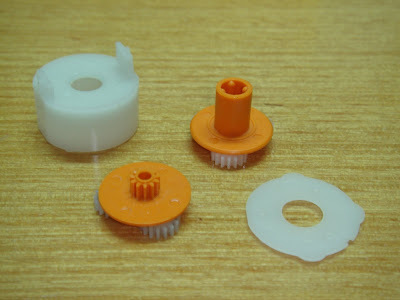 ...Another interesting thing about planetary gearsets is that they can produce different gear ratios depending on which gear you use as the input, which gear you use as the output, and which one you hold still. 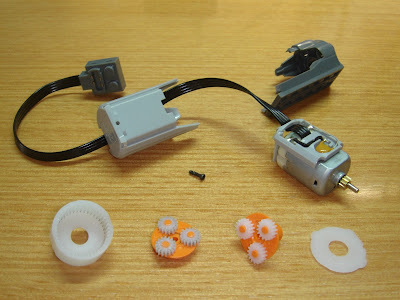 For instance, if the input is the sun gear, and we hold the ring gear stationary and attach the output shaft to the planet carrier, we get a different gear ratio. In this case, the planet carrier and planets orbit the sun gear, so instead of the sun gear having to spin six times for the planet carrier to make it around once, it has to spin seven times. This is because the planet carrier circled the sun gear once in the same direction as it was spinning, subtracting one revolution from the sun gear. So in this case, we get a 7:1 reduction. You could rearrange things again, and this time hold the sun gear stationary, take the output from the planet carrier and hook the input up to the ring gear. 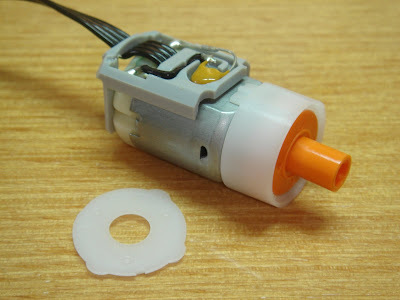 This would give you a 1.17:1 gear reduction"
The PF motors use case is the one described second, where the ring gear is hold stationary, the input is the sun gear and output shatf is attached to the planet carrier. 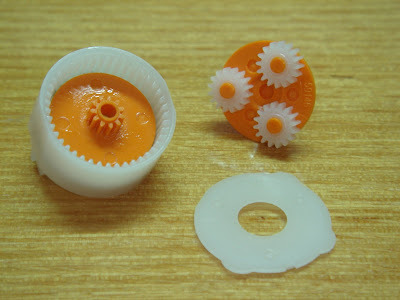 Here the gear ratio per planetary stage (GRs) can be obtained dividing Ring teeth (Rt) by the Sun teeth (St) plus 1. The second calculation (XL) was confirmed to be exact, by experimental measurements. You may find more about Planetary Gear Trains at this other TBs post, and in the other usual places above mentioned (HowStuffWorks and Wikipedia). See it in the links below. Wow, neat! Thanks for sacrificing the motor! The planetary gearing is really clever, I wonder how excited they were when someone thought it up. 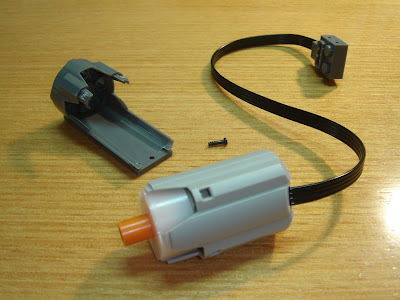 I tried disassembling my motor (because it was already broken (though the problem ended up being the wire)). I got it back working again. So, it's not a guarantee you'll lose your motor, but I'd advise anyone who tries this, it IS possible to keep your motor.